I'm pretty new to the diesel arena. I come from a car background (specifically BMW) but now I work at NC DOT and help keep the trucks running. I'm on a 2011 F350 with 197k miles on it. It's one of our IMAP trucks - the ones that help folks on the highways and interstates. I've got access to IDS and the Ford factory website, but am somewhat new to navigating the IDS software and the Ford site, so I'm still trying to root through and find information. The truck set 2 codes originally, about 200 miles ago. It set P20EE (SCDR NOx Catalyst Efficiency Below Threshold Bank 1) and P207F (Reductant Quality Performance). I found TSB 15-0042 and per that bulletin replaced the NOx sensor, reset the NOx adaptations, and sent the truck on. It came back a few days later, with another check engine light, and this time, only the P207F code, and cluster messages saying "55 mph limit in 119 miles" and "Contaminated Exhaust Fluid". I have tested the DEF with a refractometer and it was at 32%, maybe 32.1%, but not 32.5%. I'm assuming that what I have (32%) is close enough to be OK. I have not been able to check the DEF for contamination since we don't have those test strips, but I did drain over 4 gallons of DEF out of the tank and refilled it from our 55 gallon barrel that we use for all the trucks and the P207F error still came back after clearing it and test driving again. I just don't think the DEF is actually contaminated. If it was, then we'd have the whole fleet with the 207 DTC. This truck has been into the dealership 3 times for reflashes, June 2012 for 12B34, Feb 2015 for 14E03, and July 2016 for 16B24. Does anyone have any ideas? I can go drive the truck with the IDS laptop hooked up and monitor the sensors, but I'm still digging around (my IDS software UNfamiliarity here) to find the parameters I need to look for and what they should be. I'd like to see what the NOx sensor is doing, but am trying to figure out that screen in IDS. Any hints or points in the right direction would be welcomed. Further developments in testing for anyone following. Today we ran IDS and did the SCR injection test. I got zero output from the injector. None. Then we ran additional tests on the SCR system while I was under the truck feeling the DEF pump with my hand. During the times the pump should have been running, I felt no vibration or heard any noise from the pump. I then pulled the schematics from the Ford service website and removed the 5 pin connector C3613 from the pump. It had ground on 3 pins (0v on pins 1, 2, and 4), battery voltage on one (pin 3), controlling voltage (3.9v) on pin 5. So we've got a DEF pump ordered, under the logic that we've got ground and voltages going to the pump, but no pumping, and therefore no NOx reduction. I would've thought that the DEF pump would've set a fault at some point? I am only getting P207F still and no other faults. Anyway, we'll see when the pump gets here if that gets things going. Thanks for the follow up. Let us know the final resolution. We did have a bad DEF pump. It failed the IDS output test, and when we put the new pump on, it put out 46mL of DEF into the graduated cylinder. But we're still getting the P207F fault. We have also replaced the NOx sensor (first post) and now we've also replaced the NOx sensor module (BC3A-5K202-BF), I checked the programming on the module with IDS and it was up to date, and I reset PCM adaptations and NOx adaptations. DEF checks good with refractometer and contamination strips (no contamination). So now I'm moving on to the more off the wall ideas. The truck is just over 204,000 miles. Thinking the catalyst is shot - but wish there was a way to make *certain* of that before ordering the replacement (any ideas?). Need to check the EGR performance, the cooler might be partially plugged. 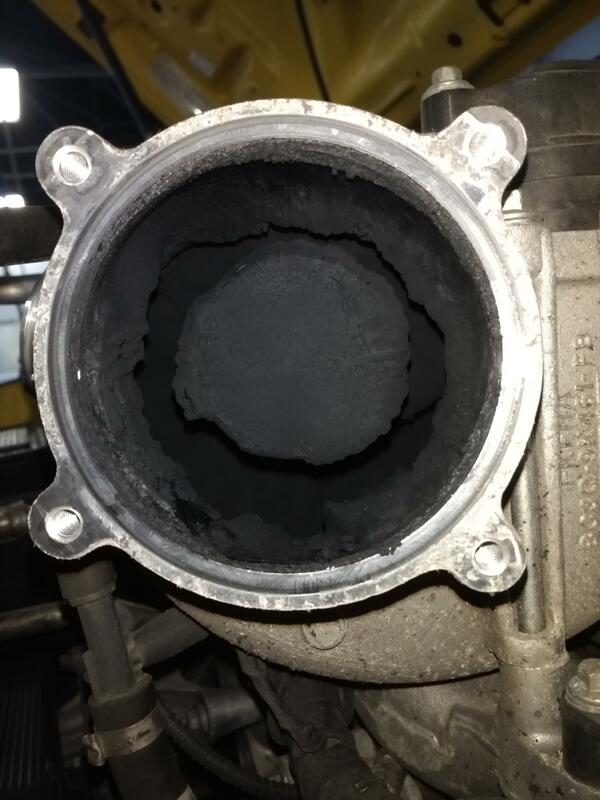 I had a recurring problem with mine and part of the repair included replacing the EGR cooler. That was 18,000 miles ago and the problem has returned. This time the dealer said it needs another NOX sensor and a DEF injector and now they say warranty won't cover it so I'm waiting to see what Ford is willing to do. Thanks for the reply - I drove it again yesterday after resetting the PCM adaptations and NOx adaptations just as a doublecheck. But we're looking at carbon issues now. I've attached a JPG of what I have found going into the intake so far. I'm just getting started and I'm off work for a couple days so it'll be the beginning of next week before I can get the rest of the intake system off and cleaned and inspected. I'll update here when I'm back into it. I'm curious on yours - they're saying the DEF injector needs to be replaced - have they done the output test? Did it not put out the amount it was supposed to? Also, can they tell you specifically why they are condenming the NOx sensor? What test did it fail? Well...just put in a brand new Ford EGR cooler, and completely cleaned the carbon out of the upper and lower intake tract. Still getting the P207F fault. And only that one. It's in Permanent memory as well as active. We've got a new DEF pump, tested to deliver 46mL of DEF during the IDS test, new DEF in the tank, new EGR cooler, clean carbon in the intake, new NOx sensor AND module. All replacement parts are genuine Ford. PCM has been programmed 3 times over the years (all recalls I believe) since 2011. Still - in 12 -19 miles after resetting the fault, light comes back on and P207F is back. Does anyone have any additional ideas? We're getting ready to condemn the catalyst - but wanted a way to test it to make sure before we did that. Ideas appreciated if anyone has them! I am curious to see where you end up. I am having the same issue. Currently replacing the DPF. Will do - I'll keep this updated as things progress. So in the end, it turned out to be the torpedo - the DPF/DOC/SCR assy. About $3,500 worth. With a $1,000 core (so I'm told). I got the new "torpedo" installed, and got all of the adaptations reset, faults cleared etc. Did the SCR Drive Cycle and headed out for a cruise on the highway. Previously, on this same road, at the same speed, I'd have from 700-900 PPM of NOx. This time, it dropped to 50 or less at cruise. Under acceleration it rose, but still not to the previous levels. Then I drove it later in the afternoon and still good. Checked for existing and pending faults - none.